Laptops and netbooks, however similar, are quite different than tablets. The most popular tablet is the Apple iPad, although companies such as Dell, Acer, Hewlett-Packard, Samsung, and Motorola have brought out their own tablets. 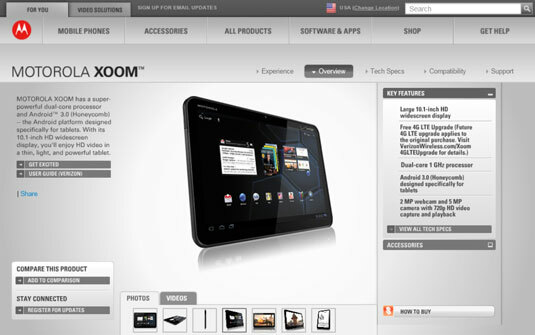 If you want a side-by-side comparison of tablets, visit Tablet PC Comparison. Input device: Tablets take their primary input from their touchscreens. With a tablet, there is no keyboard and no mouse (although you can purchase a wireless keyboard to use with your tablet if you like). Instead, you tap the screen to make choices and enter text. Tablets do not typically have a keyboard, mouse, or DVD drive. Their screens are their primary input device. They may have a camera that takes photos and video, however. Outside connection: Tablets connect to the Internet using either Wi-Fi or 3G technologies (3G is what your cellphone uses to connect virtually anywhere). 3G models require that you pay for your connection time through some kind of cellphone carrier. Primary function: Tablets were first designed as devices for consuming media — ebooks, movies, and music — and for playing games, browsing the Internet, or retrieving e-mail. Although you can do moderate word processing and number crunching with a tablet, they were not designed for that and you’ll probably find a laptop much better suited to the task. However, if you want a super lightweight device to browse the Internet, send and receive e-mail, and peruse content like ebooks, music, or movies, a tablet might be just right. Operating system: Desktops, laptops, and netbooks use computer operating systems; tablets typically use smartphone operating systems, so they work differently. Size and weight: Tablets come in different sizes such as 7 inch or 10 inch and weigh far less than a laptop. Screen resolution and processing speed: As with a laptop, tablet screens have different resolutions, meaning that some have crisper-looking graphics than others; they have their own processors (different from those used in laptops), some being faster than others; their memory capacity will almost always be smaller than a laptop and can range from 8 GB to 64 GB; and their battery life is typically longer than most laptops.